Statement of participants of 8th Balkan Anarchist Bookfair – September 13, 2014. Over the Walls of Nationalisms and Wars https://bask2014.wordpress.com/2014/09/13/over-the-walls-of-nationalisms-and-wars/ Statement of participants of 8th Balkan Anarchist Bookfair It is clear that nationalism is a tool used against the exploited classes. In the Balkans, (especially in the region of ex-Yugoslavia) the rise of nationalist ideology in the 1990’s helped enable the brutal capitalist attack against society. It further atomized the population and destroyed established networks of cooperation and solidarity. The need to confront nationalist ideology from a radical and anti-authoritarian perspective gathered us in Mostar on the 5th and 6th of September 2014, for the 8th Balkan Anarchist Bookfair. We came from Bosnia and Herzegovina, Croatia, Serbia, Slovenia, Albania, Romania, Greece and other countries outside the Balkan area. The true nature of nationalism is nowhere more obvious then in Mostar, a city divided in two, with the signs of wartime brutality still evident in the streets of the city. It is essential to realize that this division was not the cause of war, but the consequence of wars and nationalist ideologies created by the ruling class. 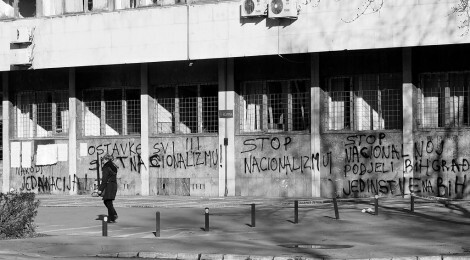 This was clear to the demonstrators in Tuzla who wrote the graffiti “Death to nationalism” as well as to demonstrators in Mostar who burned down the headquarters of both nationalist parties in February. Still, in other parts of the world new nationalisms and conflicts are being created on similar lines and with predictable consequences. Many in the Ukraine today think they have to respond to the false choices of war posed by states and corporations (amongst them are even some anarchists and “anarchists”. We, however, maintain that nationalism is always an ideology that reproduces the State, a system of repression and exploitation, and pits the exploited and oppressed against one another. Today we see in the Ukraine the same mechanism that was used also in the war(s) in former Yugoslavia: Nationalism is the tool of those in power to push people into war for the interests of capital. As anarchists, we opposed all war efforts in former Yugoslavia through solidarity that continues to this day. Far from liberal pacifism or obsessions with left-nationalist guerrilla armies, our struggle will never take the side of militarist politics and the destruction that all states are based on. Against nationalism, militarism and war! Against all governments and states! For solidarity and autonomy! ___________________________  From anti-colonial nationalists of “Mlada Bosna” from Sarajevo of 1914 influenced by anarchism, and especially to the case of posers like the “anarcho”-nationalist group “Slobodari” from Sarajevo of 2014, all attempts of combining anarchism with nationalism, have shown that the result is simply: nationalism. “Slobodari”, are a small group from Sarajevo who pose as anarchists but are in contact with Nazis from the Ukraine (the so called autonomous nationalists “Autonomous resistance” ). They have many websites which created a lot of confusion, including a Balkan anarchist black cross website, more on this here: http://www.sabotagemedia.anarkhia.org/2014/03/on-self-styled-libertarians-and-antiauthoritarians-from-bosnia/ — See also, transcript of Slovenian radio show prior to the bookfair (English part is at 1:48 till 20:00 with one song in between): http://www.radiostudent.si/druzba/crna-luknja/bask-septembra-2014-prihaja-v-mostar English text from the radio show: We turn our attention today to the Balkans as seen, understood, imagined and built by the anarchists of the region. After last year’s inspiring gathering in Ljubljana they will be meeting, plotting and mingling at the Balkan anarchist bookfair again in early September this year. This time in Mostar in Bosnia and Herzegovina. After a brief introduction we will hear more about the bookfair directly from Alan, one of the Mostar comrades. History teaches us that stakes are high in the Balkans, even more so in precarious times of ours when the usual balance of power is often challenged on both global geopolitical and local level. Sometimes by the genuine aspirations of people striving to build the world free from all exploitatin, but often also by dodgy interests working in the shadows. As we all know it was in the Balkans that the first shots of the I. World War were shot a century ago. That war ended with mighty empires destroyed and promises of a new revolutionary and just world still not fully betrayed by the self-appointed avantgadist class. The Balkans remained a space of social and political experimentation throughout 20th century. It had its share of radical workers struggles and inspirational and to same extent successful revolutionary projects. It also had its share of military dictatorship, totalitarian one-party rule and war. Despite its many promises 20Th century ended with the war that tore Yugoslavia apart and stroke a huge blow to the vision of just, anti-capitalist and anti-nationalist future in the Balkans. Now back to the present. The Balkans has not remained calm during the latest capitalist crisis that is – rather predictably – being used by global financial institutions to redistribute the wealth towards the already rich, using the forcefully imposed regime of austerity as a tool. That Greece has been a laboratory of not only the neoliberalism but also of the resistance against it is widely known. But in recent years mass protests against the continuous social destruction erupted in an unprecedented way in Bulgaria, Slovenia and to a lesser degree in Croatia. And while Serbia is being constantly on the edge of an eruption, some promising antiauthoritarian struggles against capitalist nigtmare are emerging also in Romania around the opposition to Rosa Montana gold mining project. And in february this year Bosnia and Herzegovina was the site of the last and maybe the strongest expression of rejection of capitalist conditions that are being imposed on the people by the country’s nationalist elites. It is fitting then that Mostar, a city in Bosnia and Herzegovina will be a host to this year’s Balkan Anarchist bookfair. Under the theme “Over the Walls of Nationalism” many anarchists and other anti-authoritarians of the Balkans and beyond will converge in Mostar in the early days of September this year. We were speaking with Alan about the bookfair, the recent uprising in Bosnia and its aftermath, the pressing issues facing anarchists in local context of Mostar and about the role that anarchism and anarchists could have in a place that has been so devastated recently by capital and nationalism. [Intervju] The invite is open to all anarchist and antiauthoritarian groups, individuals, publishers, initiatives and projects from Balkan and beyond. Come and participate at the bookfair, in discussions and meetings which will help us build solidarity networks and strong anti-nationalist and anti-capitalist movement in the Balkans and beyond. All the latest information about the Balkan Anarchist Bookfair 2014 in Mostar can be found at the webpage: bask2014.wordpress.com or just search the web for Mostar Balkan Anarchist Bookfair 2014. See you soon in Mostar! Vidimo se uskoro u Mostaru!